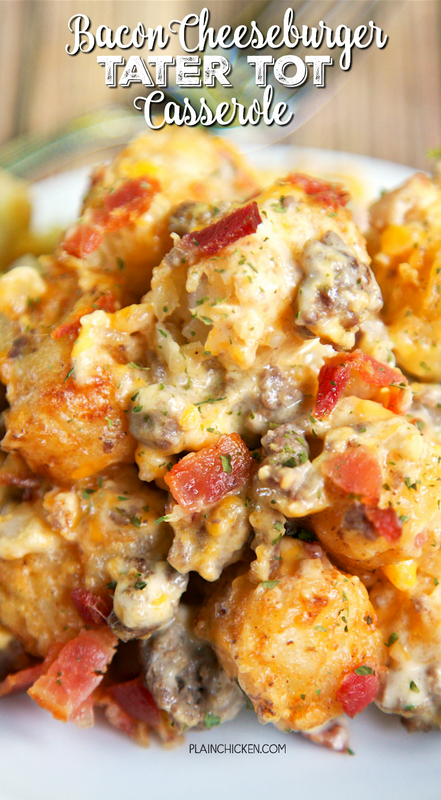 Bacon Cheeseburger Tater Tot Casserole - hamburger, bacon, cheese, cheese soup, sour cream and tater tots - what's not to love? We ate this twice in one day! Can be made ahead of time and refrigerated or frozen for later. You can also divide it between two 8x8-inch foil pans and freeze one. Great for a potluck and tailgating this fall! 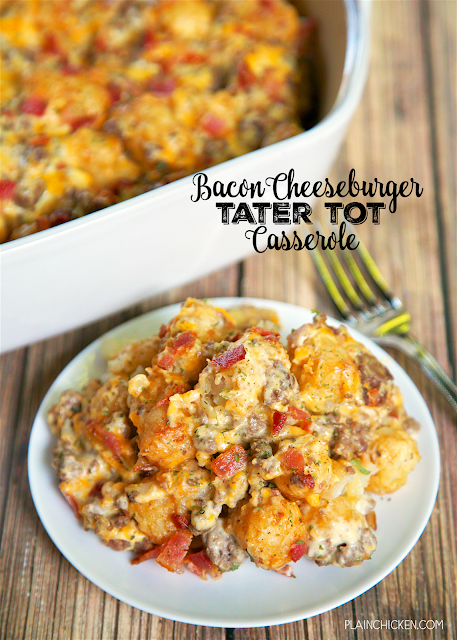 I can't get enough of this Bacon Cheeseburger Tater Tot Casserole! It was SO good. Like, really, really, really good. We ate this for lunch and dinner the same day! That should tell you how much we liked it. Hamburger, bacon, cheese, cheese soup, sour cream and tater tots - what's not to love? Just heat up some green beans and you have a full meal! 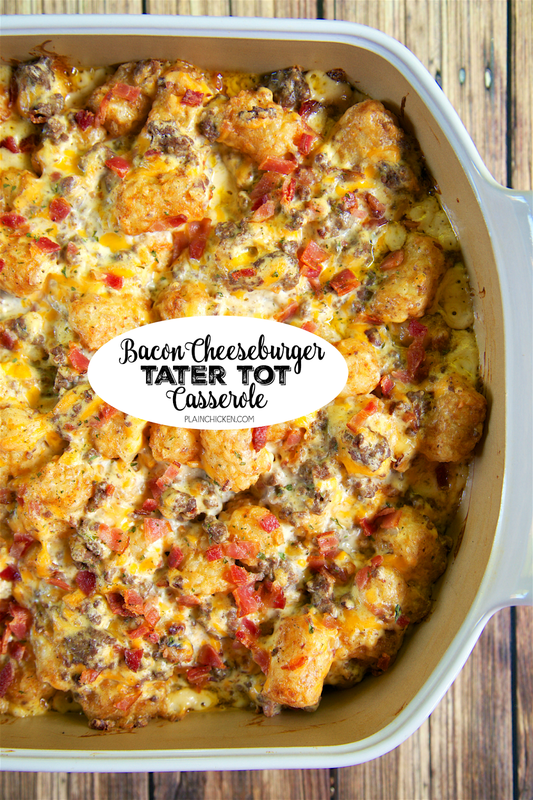 This Bacon Cheeseburger Tater Tot Casserole can be made ahead of time and refrigerated or frozen for later. You can also divide it between two 8x8-inch foil pans if you don't need to feed a larger family. We actually have a pan in the freezer right now! 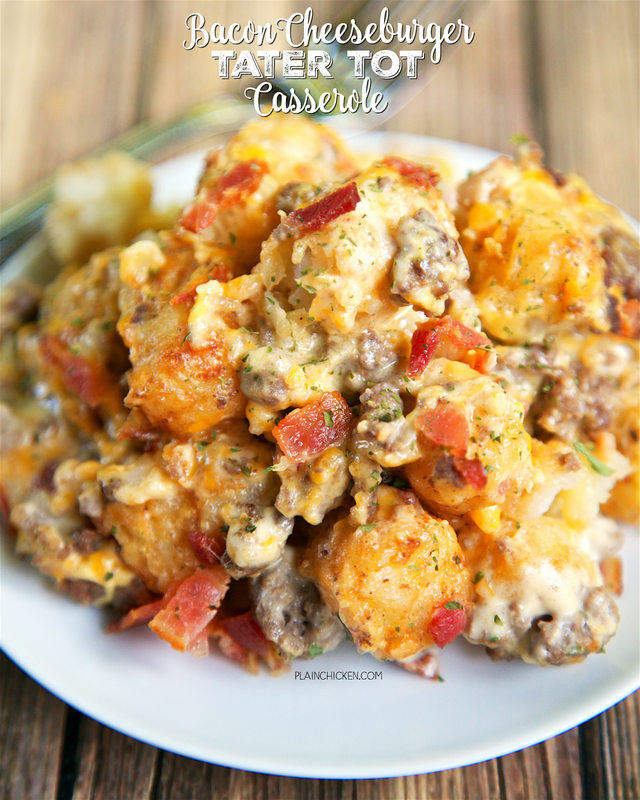 This Bacon Cheeseburger Tater Tot Casserole is guaranteed to please the whole family. You can even add some tomatoes, peppers, mushrooms and onions to the mixture if you wanted to jazz it up. It would be great for a potluck. I think this would be perfect for tailgating this Fall too! Cook ground beef in a large skillet until no longer pink. Drain fat. In a large bowl, combine cooked beef, bacon bits, cheddar cheese, tater tots, cheese soup and sour cream. Mix until throughly combined. Bake for 45 to 50 minutes, until bubbly. Do you thinhk you could make it in a crock pot? We had this last week and it was a hit. I will definitely make this over my old tatter tot casserole recipe. I made this tonight but doubled it for my house and the neighbors. I added onions, garlic powder, and hamburger seasoning. Everyone in both houses loved it. Thank you for sharing this great recipe. Are the tater tots frozen when you mix all the ingredients ? DO you think you could use the tater rounds? I like that they are flat so they get even crispier! What can I use for the cheese soup, since I don't have any on hand and I would love to make this for my husband tonight. I made it with cream of mushroom since i didnt have it either and it worked fine! Could you replace the cheddar cheese soup with say Velveeta? My daughter has celiac disease and we cannot use the soup. No exaggeration - this is really good! I used Ore-Ida Mini Tater Tots and an entire package of precooked bacon (2.6 oz). For a little extra flavor I added a sauteed onion and some Lawry's Seasoned Salt. By mistake we purchased the Campbell's Healthy Request Cheddar Cheese soup (instead of the regular type) and it worked out fine. Loved it!!! Are the bacon bits real crunchy when you cook them? Can't have something too crunchy, needs to be a bit softer. Thanks! No - I used the precooked bacon pieces/bits and they aren't hard. You can also use an equal amount of cooked chopped bacon. Are the bacon bits really hard/crunchy after you cook them? Or do they soften up? Have no cheese soup on hand. Since Shredded cheese is an ingredient would it work to replace cheese soup with cream of mushroom? I'm assuming other than changing flavor slightly it would work. Yummy. Made it by recipe the first time and was great. Second time I added some onion and because I like pickly, added some chopped up pickle on just my plate. Was awesome. Will make again and again. Great additions!! So glad you enjoyed it! Made it tonite - super-good!! I changed a couple of things... I cooked up a 8 oz pack of bacon and chopped that up instead of the bacon bits, rendered the bacon fat and used that to grease the 9x13, browned the beef with onions & garlic, added a 10 oz package of frozen supersweet corn and used half the shredded cheese. I give it a little zip with Whataburger Spicy Ketchup on top. I'n adding it to my "Dad's in charge of dinner" rotation. I let my daughter go through my Pinterest recipes and pick out something for me to cook for her sleepover (13 yr old's). The girls loved this! & so did my son and hubby! I turned this one into my breakfast casserole! Just traded out the hamburger meat for breakfast sausage and added a pack of ranch! SOOO good! Thank you!! We just made this recipe tonight. It was outstanding! Delicious! Will definitely be making it again! We cooked it a little longer to make it more crispy. We had to subsitute the cheddar cheese soup with a Ragu cheddar cheese sauce and it came out fine (all we had!). Thank you for sharing a great recipe! Tried this tonight, used ground venison and subbed in nacho cheese sauce instead of canned soup. It was delicious! Warm comfort food at it's best! Thank you for sharing. Great recipe! I leave off the bacon. (personal preference) This is one of those dishes that is better the day after. Do you think this could be made in advance, kept in the fridge and cooked the next day? What is something you could make for a side dish? My boyfriend doesn't like sour cream so I am thinking of using 2 cans of cheese instead. Any other suggestions? After you freeze it, how long do you bake it from frozen? I have never baked this frozen. So, I cannot answer with certainty. As always, please use your best judgment regarding modifications. I like putting the tater tots on the top in rows instead of mixing in. they stay crunchy that way. Great recipe! I put half the tater tots in thehe mixture, and half on top. Then right before i take it out, I put cheese and bacon bits on top of the crispy tater tots. It's delicious. Hubby and I loved it. I made a few changes like cooking the tater tots first, then lined them on the bottom of the dish. I reserved 1cup shredded cheese for topping. I added one shallot to the ground beef. I cooked 1/2 lb of bacon and diced it. I don't really care for bacon bits. I mixed all the remaining ingredients. I layered the mixture over the tater tots and topped with cheddar cheese and baked for 20 min at 350. Plain chicken thank you for the inspiration.